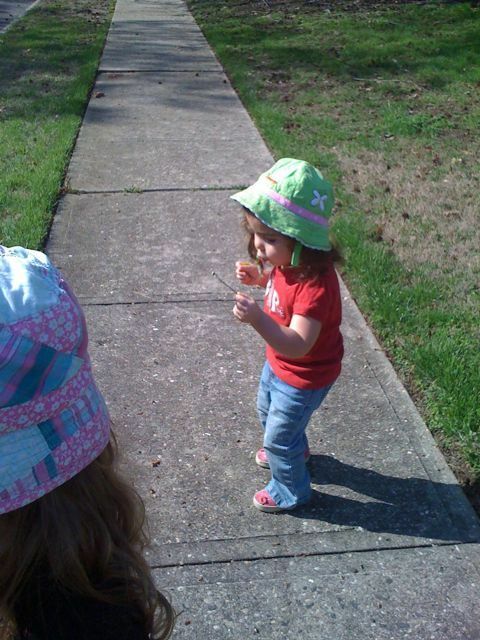 As the weather gets nicer, the kids and I are able to go on more walks, especially in the afternoon post-nap, pre-dinner lull. Anya’s favorite activity during these walks is to yell “tweet” at the birds and then tell me she’s talking to them in bird language. 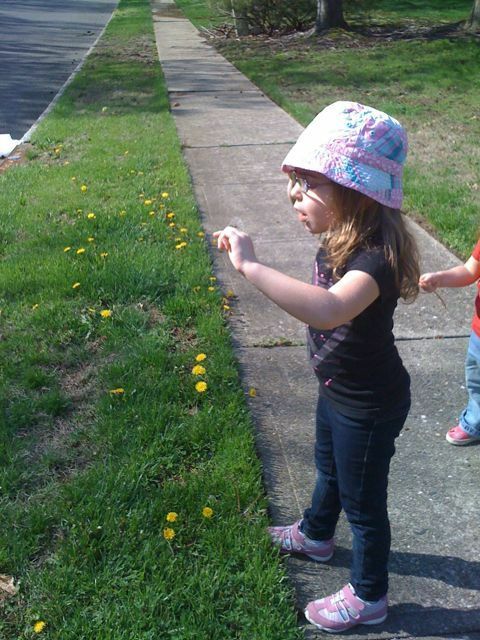 Sierra’s is to pick as many yellow flowers – dandelions – as possible. I should charge the neighbors for the weeding services she provides. Today we went in a different direction from our usual route, and we came upon a house at the corner of the block whose lawn was a veritable field of dandelions. 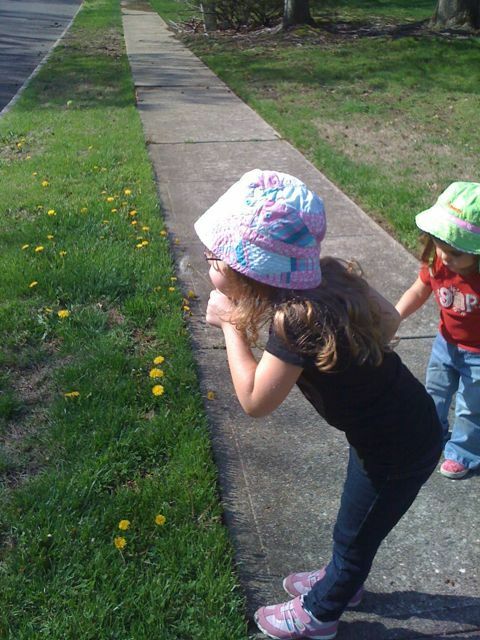 Sierra could barely contain herself, and even Anya took a break from her bird communion to appreciate the flowers, especially when she noticed the many “wishing flowers” – what she calls the dandelion puffs. 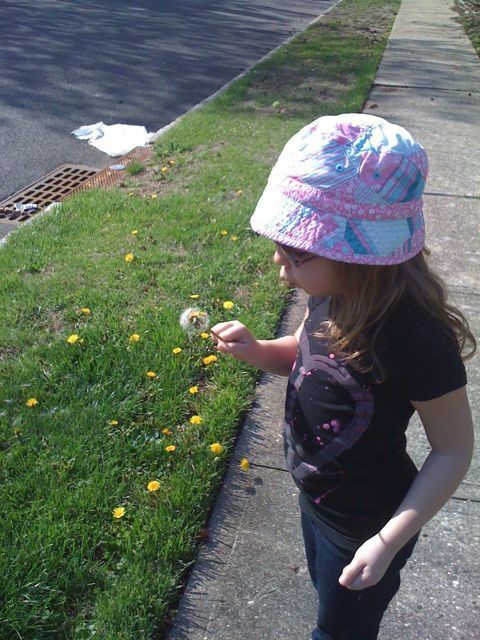 She picked one and told me she was going to make a wish (I love that she remembered this after so many months of winter! 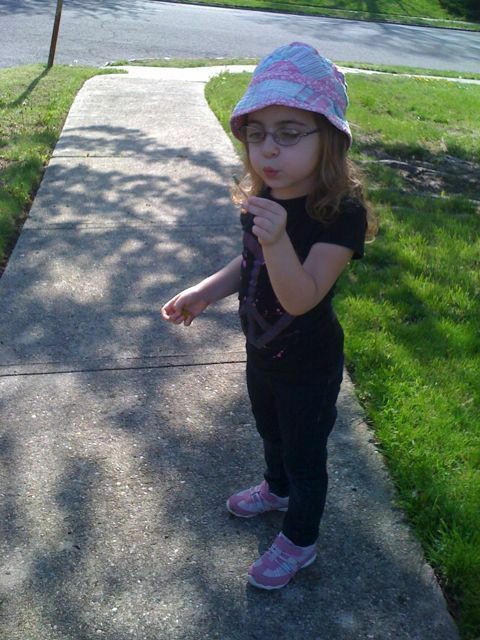 ), and then blew the seeds off with all of her 4-year-old might. She told me she wished to be a princess with a mean witch who turns into a nice witch. Sierra was intrigued by the wishing flowers and wanted to have one, too. The girls probably picked 12 between the two of them and happily blew the seeds throughout the neighborhood (There goes our weeding business). I just loved watching their pure kid joy as they watched the little puffs take to the air. I hope these are the moments they remember. 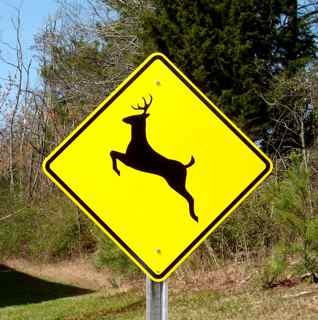 Every kid is different, and I know that, but sometimes it still surprises me. Sierra, who had been underfoot the entire time I was trying to make dinner (as she often wants to be), announced that she had to go potty again, even though I had taken her not 10 minutes before. Already annoyed by how much she was hindering my ability to get dinner together, I told her that I was not going to take her since she had just went. I insisted that she did not actually have to go and sent her to play. I thought she went into the playroom. 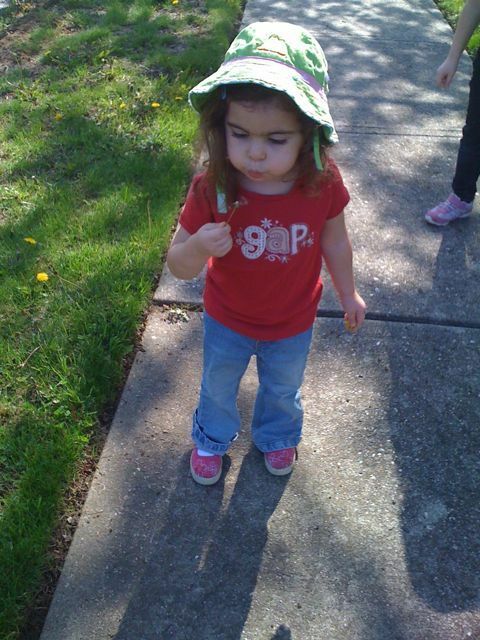 Then a few minutes later I heard the sound of peeing and the words, “I really had to go potty.” I went to the bathroom to find her sitting on the toiled (with no potty seat! 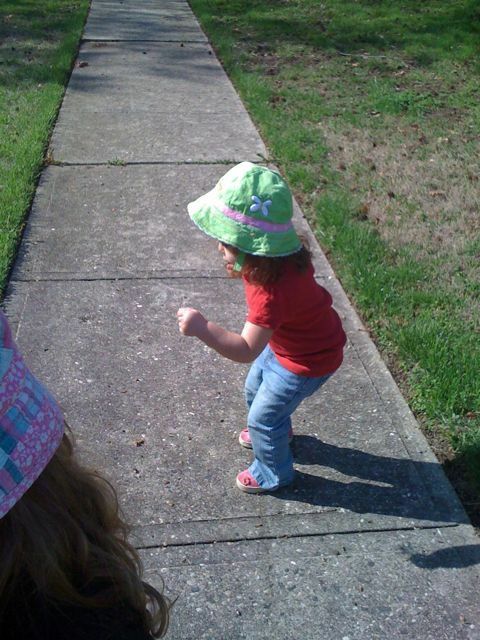 ), having pulled down her pants, gotten a stool, and climbed on by herself. She was super proud of herself, especially because she was sitting right on the toilet like a big girl. Anya never would have done that at this age (2 years and 4.5 months), so I was pretty shocked. I’m not comparing them, but sometimes I forget to remember that they aren’t the same kid and that I can’t have the same expectations, both in terms of things Anya did that Sierra doesn’t do and vice versa. I can’t wait to see what surprises Liam has in store for me! 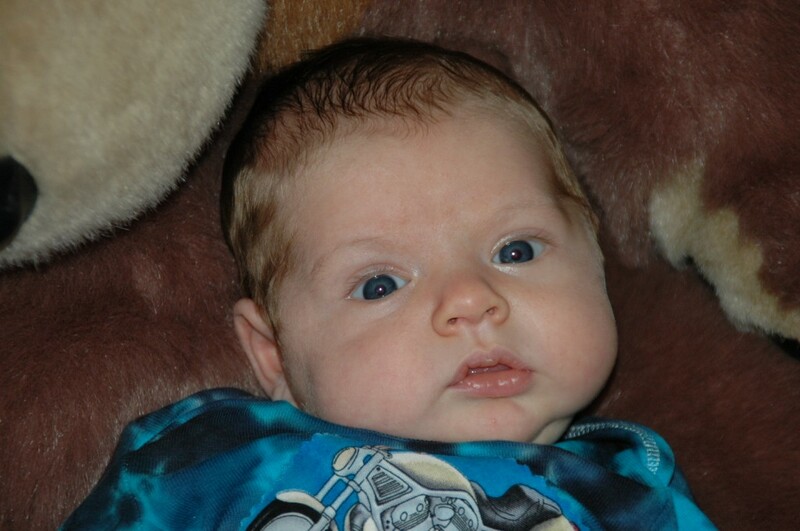 Liam turned 1 month old on March 26th (and he’s already 5 weeks old as I write this). 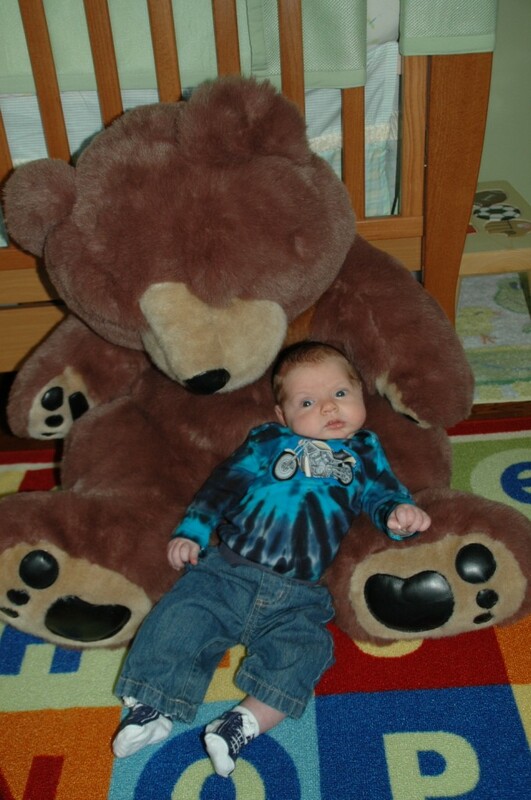 He had his check up on Monday – 11 lbs, 3 oz and 23 1/4 inches already. The boy is huge, but that’s not surprising given how often he eats – we’re lucky if we get to two hours between feedings. I feel that Liam is a bit of a cranky, borderline colicky baby, at least compared to how I remember Anya and Sierra being at the same age (and certainly according to what I wrote about them in their 1 month updates). His first two weeks he was pretty content, but then it seemed like he was crying more often than not when he was awake. He really hates being put down anywhere, even in a swing, and screams when he’s being buckled into the car seat. In the past few days he’s been able to handle a few minutes on the playmat here and there, which has been nice. 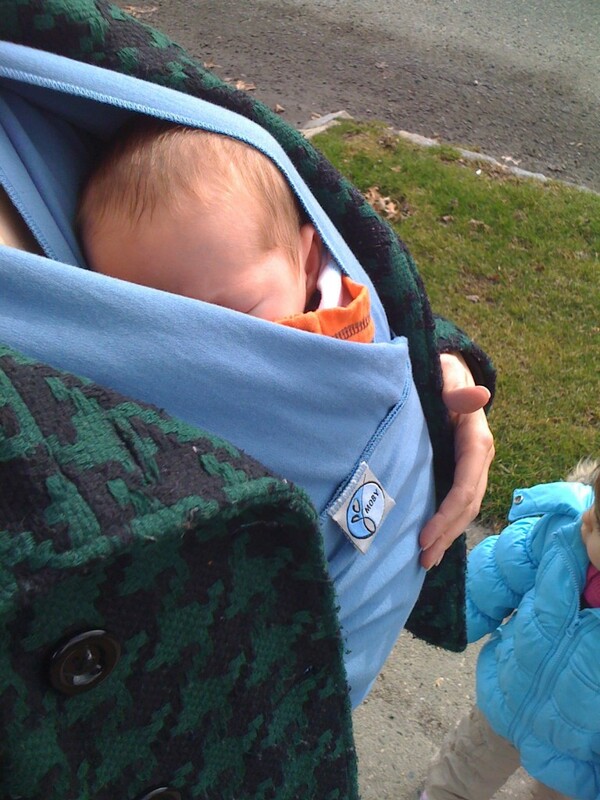 However, Liam spends a good portion of his day being worn in a carrier. He naps in one pretty much exclusively. 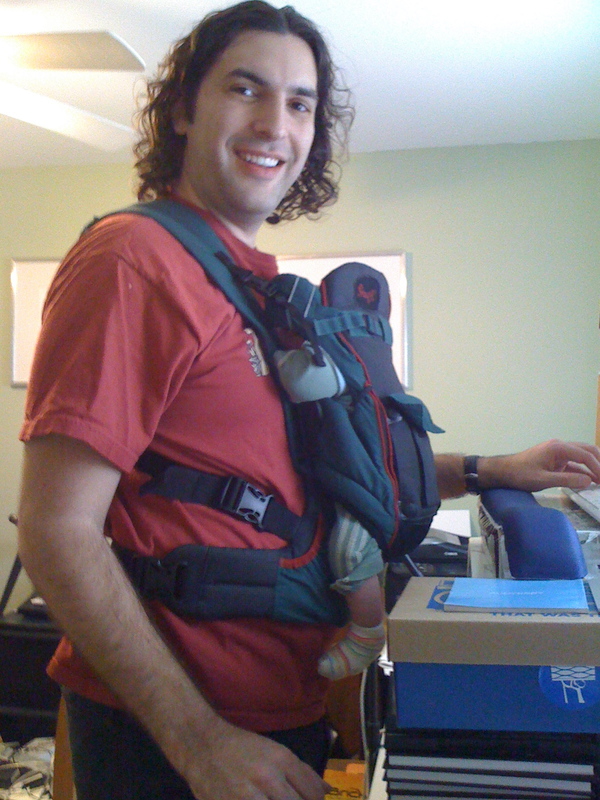 I love babywearing – I’d wear him even if he was the most content baby in the world – and definitely wouldn’t be able to get anything done without it, but it would be nice if he could handle a little more down time, too. There are some things that would just be faster (like changing the sheets on the girls’ beds) if I didn’t have 11 lbs of baby strapped to my chest. It’s almost like I’m still pregnant! One thing that has improved is his tolerance for having his diaper changed – like his sisters, he would cry as soon as the diaper came off at first, but now he’ll usually like there, content to admire the lights or the rail of his changing table.